In 1763 the proprietors of Pennsylvania and Maryland commissioned a land survey to resolve the long-running boundary dispute between the two provinces. Dozens of “axe men” spent the best part of five years clearing lines through the woods, to enable two Englishmen, Charles Mason and Jeremiah Dixon, to use astronomical methods to determine latitudes with unprecedented precision. Whilst in America, Mason and Dixon used their delicate and expensive instruments, shipped specially from London, to measure a degree in the Meridian for the Royal Society, providing valuable measurements from the New World to aid the ongoing attempt by astronomers and mathematicians to determine the exact shape or figure of the Earth. A 1750 London court case had resolved that the boundary should consist of three principal sections, namely a line west along a parallel of latitude exactly 15 miles south of the southernmost point of the city of Philadelphia, an arc of a circle of 12 miles radius centred on the town of Newcastle in present-day Delaware, and a tangent to that circle, originating at the point where the circle intersected the Western line and extending roughly southward into the modern day Delmarva Peninsula. Earlier surveys had proved unsatisfactory, in part because of the oddity of the defined boundary, and in the early 1760s an astronomical survey was resolved upon. It would use a newfangled telescope known as a zenith sector, made by London instrument maker John Bird, to determine geographical latitudes with respect of the stars. Mason – a former assistant to the Astronomer Royal at Greenwich – and Dixon arrived with their cargo of clocks, telescopes, chains and rods at Philadelphia in November 1763. By late 1767, the parallel of latitude extended some 230 miles, an arc of circle physically carved out of the woods, uncannily geometric, exactly westward, the land made map-like by the act of surveying. In between the daily measurements and observations, Mason’s Journal, like many 18th-century travel narratives, details enormous trees, extreme weather, awe-inspiring caves, spiritual reflections, and accounts of numerous encountered peoples. 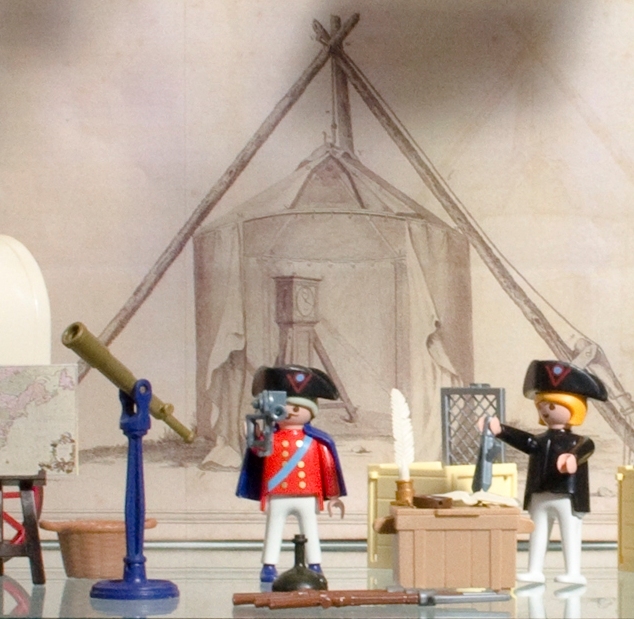 As part of an exhibition about navigation, astronomy, trade and empire in the 18th century that I curated in 2012 at the Whipple Museum of the History of Science in Cambridge, I tried to represent the survey with a miniature diorama made of Playmobil. Part of the appeal was that a diorama foregrounds people: often in history of science museums historic instruments of glass and brass are displayed in isolation, with little reference to the people that used to them. Miniature models of astronomers using instruments do exist in a couple of museums, which provided some inspiration, but I specifically wanted to present the Mason and Dixon survey as an encounter between the British surveyors and numerous different peoples, including Native Americans. Museum dioramas, however, can often be viewed at best as rather naff, perhaps because of their literalism, and at worst racist in their displaying of models of humans as if they were natural history specimens. My diorama was intended in part to comment on the problems and limitations of representation, and this blog post describes how I navigated such problems. 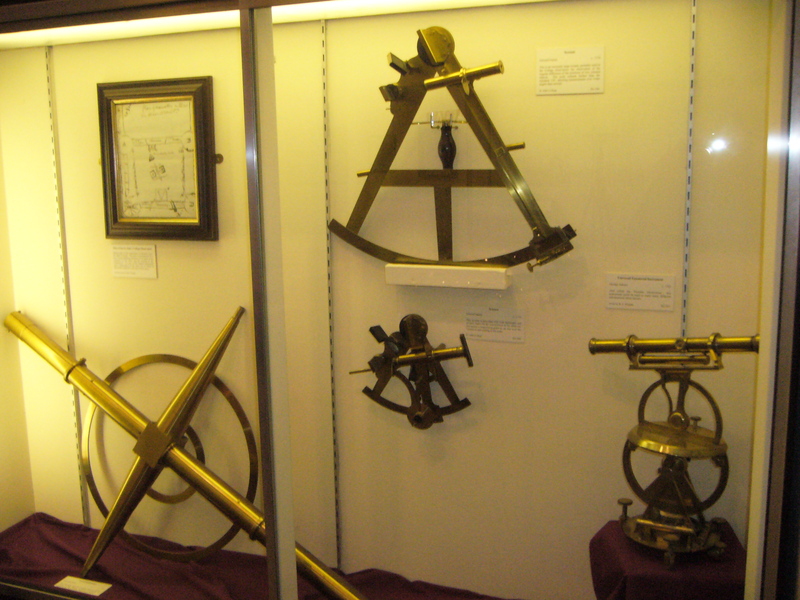 Here are some examples of mini astronomers and navigators in museums which I like. 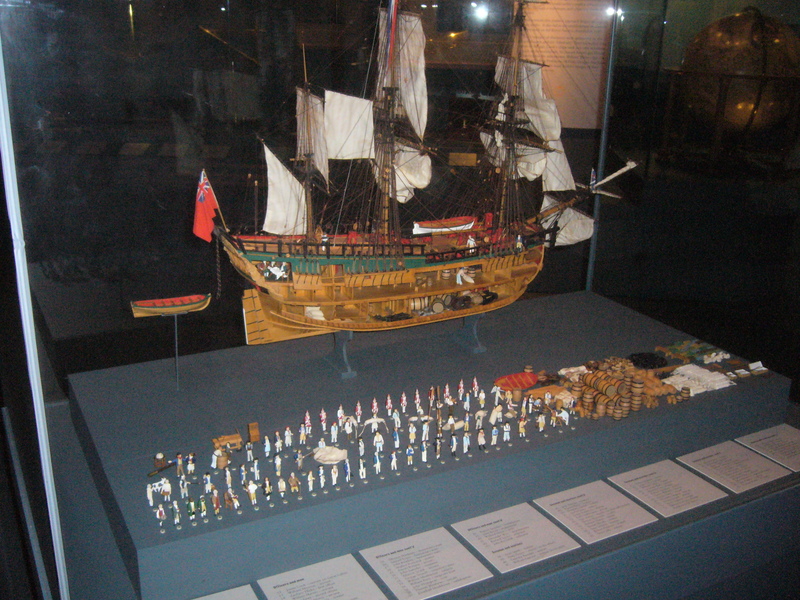 The early 1970s model of the Endeavour, captained by James Cook, on display at the National Maritime Museum, Greenwich, does, amongst other things, a great job of demonstrating the important point that it took a very large number of people to sail halfway across the globe to observe the transit of Venus at Tahiti in the late 1760s: observations and discoveries are seldom solo affairs. The details are great, too: check out the tiny telescopes and octants, for instance. 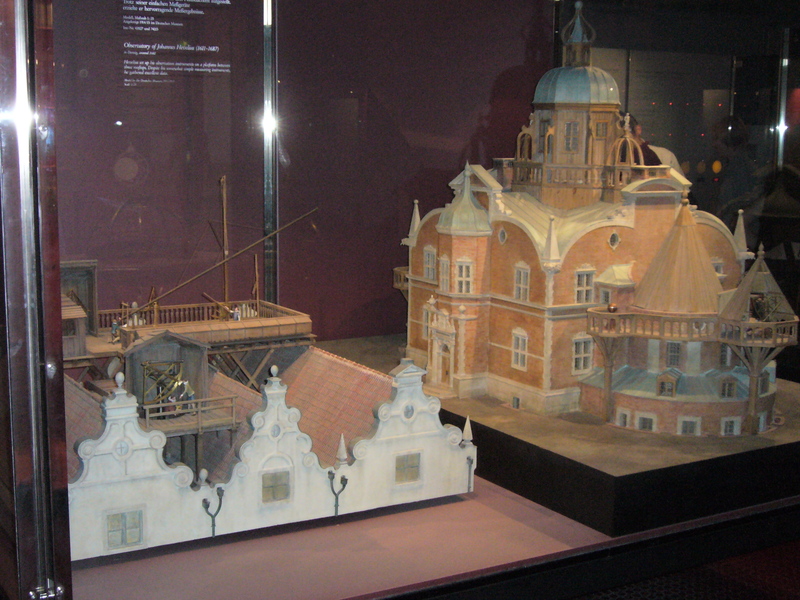 In the Deutsches Museum in Munich, there are two scale models of historical observatories, one depicting the observatory of Johannes Hevelius (1611-1687), and one depicting Tycho Brahe’s (1546-1601). Like dolls’ houses, these models have pathos and weirdness in equal measure. Hevelius and a colleague are depicted using a wonderfully detailed fixed quadrant. Tycho seems a sad, melancholy and slightly absurd figure, alone on the roof surrounded by his expensive instruments. Life-sized models in museums of historical events can similarly be both informative and a bit weird. 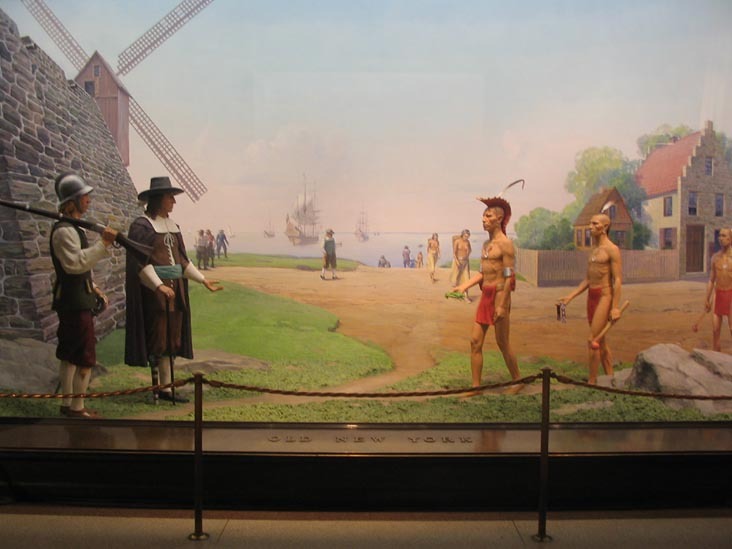 Below is a life-sized diorama depicting an encounter between Dutch settlers and Native Americans in Manhattan in the 17th century. It’s on the lower ground floor of the American Museum of Natural History, New York City, home of some of the most celebrated habitat dioramas ever made. I find it quite unsettling viewing, given that it’s in a natural history museum, displaying humans in their habitat in exactly the same manner that bears and bison are shown one floor up. Turning peoples into exhibits has a long and uncomfortable history; displaying models of humans almost as if they were hunting trophies is, well, pretty shocking actually. 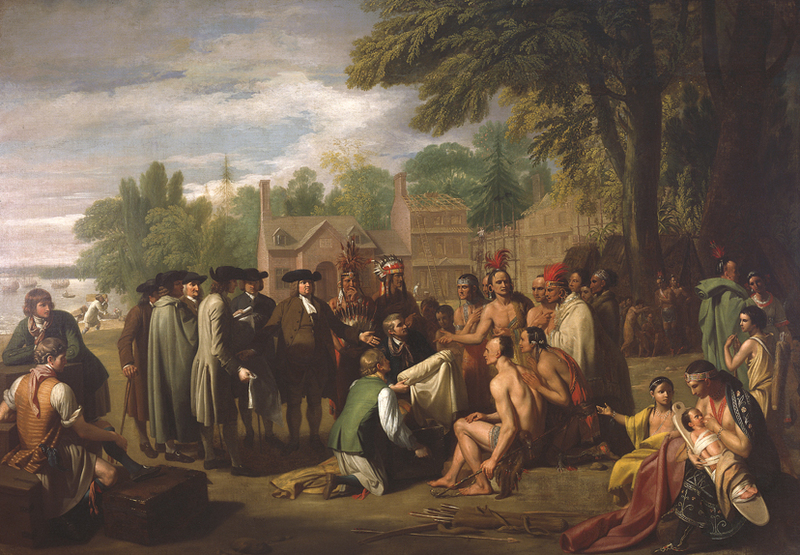 Penn’s Treaty with the Indians, Benjamin West, 1771-72. Courtesy of the Pennsylvania Academy of the Fine Arts, Philadelphia, http://www.pafa.org/museum/. Gift of Mrs Sarah Harrison (The Joseph Harrison, Jr. Collection). This work by Benjamin West was commissioned by William Penn’s son Thomas Penn in London in 1771. It depicts his father solemnly yet cordially coming to an agreement with the locals nearly a century previously, in 1682. If Penn and his heirs successively took possession of more and more land from Lenape and other peoples from the 1680s onwards, the painting suggests it was through lawful, agreed-upon and unambiguous treaties, purchases, maps and surveys. 10 years previously, Thomas Penn had commissioned a different sort of method of civil legitimation of his territorial control, namely the boundary survey of Pennsylvania and Maryland. Mason and Dixon’s six-foot radius zenith sector telescope, designed exclusively for very exacting observations of the meridian transits of stars almost directly overhead, travelled in its own cart, on a feather bed. Sadly you can’t get a Playmobil zenith sector, but they do make sextants, magnetic compasses, pendulum clocks, quill pens, fixed pivoted telescopes, grey wigs and tri-cornered hats. The pendulum clock is a little anachronistic, looking more 19th than 18th century. Remarkably, the actual pendulum clock made in London by John Shelton and used by Mason and Dixon in America survives today in the collection of the National Museum of Scotland in Edinburgh. 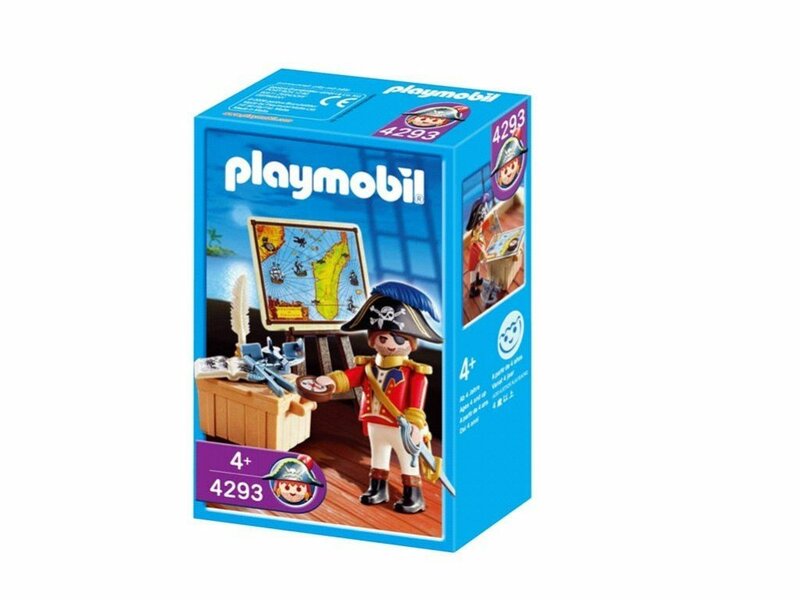 Most of the navigational and astronomical devices came from the Playmobil Pirates range: evidently piracy is a precision science. I was pleased with the trees: Mason’s Journal, in addition to the daily stargazing (often thwarted by cloud), clock-checking, milepost-marking, and repetitive mathematizing, details the extremes of heat and cold, thunderstorms, terrain and topography, mountains, caves and forests, with occasional asides reflecting upon their spiritual, perhaps providential, meaning. On September 13, 1764, near the River Nanticoke he observed “the greatest quantity of Timber I ever saw”, towering most of all “the lofty Cedar…the pleasing sight of which; renewed my wishes to see Mount Lebanon.” “From the solitary tops of these mountains, the Eye gazes round with pleasure; filling the mind with adoration to that prevading [sic] spirit that made them”, he noted on June 14, 1766. Three weeks later, on July 7, he described the arc of circle, impressed by the geometry and scale of the survey: “This day from the Summit of Sidelong Hill I saw the Line still formed the arch of a lesser circle very beautiful, and agreeable to the Laws of a Sphere”. Astronomer Royal Nevil Maskelyne, back in Greenwich, later remarked of the tangent section of the boundary, that “the country in these parts being all overgrown with trees, large openings were cut through the woods… which formed the straightest and most regular, as well as most extensive, vistos that, perhaps, ever, were made”. As they proceeded with their survey, Mason and Dixon were attended by an increasingly large entourage of porters, axe men, cooks, and as they ventured west, Native American guides. The country west of Philadelphia was of course neither unpeopled nor uncharted, and the land was already inscribed with lines, trade routes, war paths and boundaries. White Europeans encroached ever further west, whilst, following both the Seven Years War and the Pontiac Rebellion, the Royal Proclamation Line of 1763 sought to limit, without great success, settlement anywhere west of the ridge of the Appalachian Mountains. The English astronomers would have learned early on how close the western frontier was: in December 1763 news reached Philadelphia of the massacre of Conestoga Indians 75 miles away at Lancaster, Pennsylvania, by a mob of Scots-Irish frontiersman known as the Paxton Boys. On January 10, 1765 Mason travelled by horseback to Lancaster. “What brought me here was my curiosity to see the place where was perpetrated last winter the Horrid and inhuman murder of 26 Indians, Men, Women and children, leaving none alive to tell”, he wrote. By late 1766, the surveyors were approaching the Proclamation Line. The Commissioners overseeing the survey appointed General William Johnson, His Majesty’s Agent for Indian Affairs, to gain consent from the Six Nations (or Iroquois Confederacy) to extend the line. The last 80 or so miles of the Western line were surveyed during the summer of 1767 by an increasingly large party accompanied by members of the Mohawk and Onondaga Nations, and interpreter/go-between Hugh Crawford. 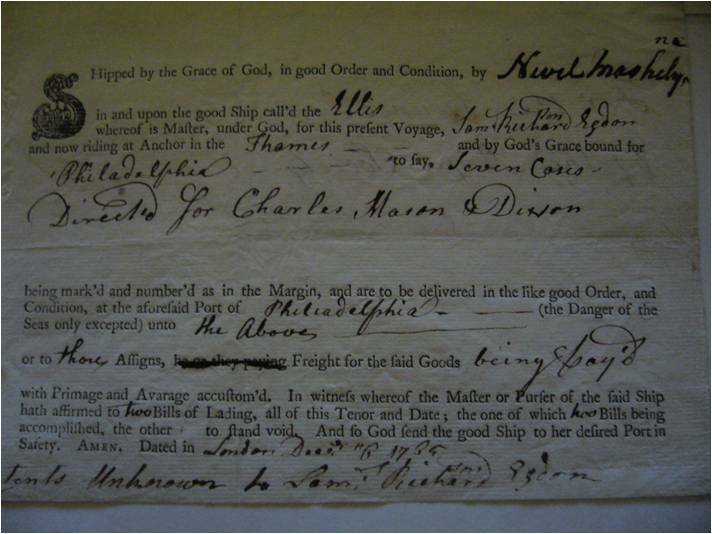 Back in the 1730s Thomas Penn and his agents had connived to displace the Lenape (Delaware) people from their lands in the Delaware Valley through a mixture of fraudulent title deeds and an extraordinary episode in the history of surveying now known as the Walking Purchase. This involved both a straight line cleared through the woods in advance by axe men, and the extent of a boundary being determined by a race to see how far three men could travel in a day and a half along this cleared vista. Thirty years later, as Mason and Dixon approached lands settled by the Delaware in the Ohio Country, the very people displaced by the Walking Purchase, delegations of curious and/or hostile Delaware visited the party, as did later “Eight Warriors” of the Seneca Nation (part of the Confederacy), heading “in their way to the southward going against the Cherokees”, Mason noted. As historian Cameron Strang has recently discussed, both the continuation of the survey beyond the Proclamation Line, but also its ultimate extent, was a result of continual negotiation between Delaware, Iroquois and British representatives: “surveyed lines in the borderlands of colonial North America were not just defined by colonial officials or the scientific activities of the surveyors themselves…but were products of numerous on-site negotiations”. The extent of the Western line was determined by the mood of the whole party: “26 of our men left; they would not pass the [Monongahela] River for fear of the Shawanes and Delaware Indians”, Mason noted in late September 1767. His Journal entry for October 9, 1767 begins “Continued the Line to a High ridge. At 231 miles 20 chains Crossed a War Path”. “This day the Chief of the Indians which joined us on the 16th of July informed us that the above mentioned War Path was the extent of his commission from the Chiefs of the Six Nations, that he should go with us, with the Line; and that he would not proceed one step farther Westward”, which more or less brought the survey to an end. 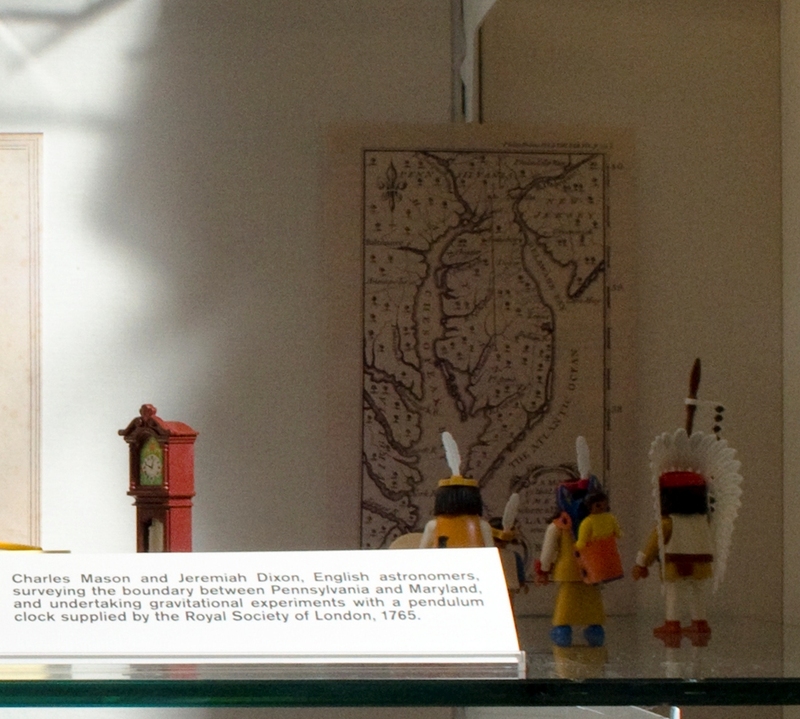 Cigar Store Indians, Mining the Museum: An Installation by Fred Wilson, Maryland Historical Society, 1992. Courtesy of Maryland Historical Society, [MTM 004]. There were several different encounters between Mason and Dixon and various different groups of Native Americans I could have depicted: in dialogue, exchanging expertise, leading, following, together, apart, communicating, failing to communicate. 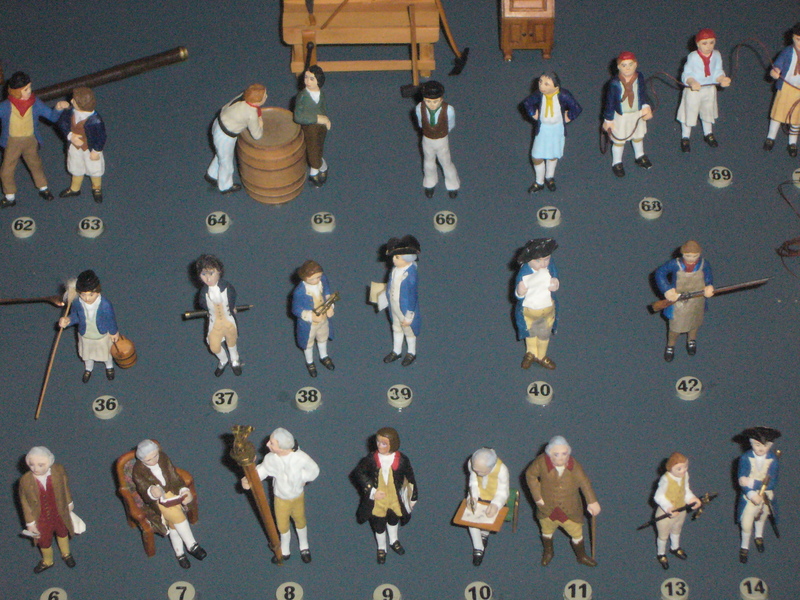 I chose to pose my Playmobil figures apart from the English astronomers, contemplating a version of the map that accompanied Mason and Dixon’s 1768 account of their measurement of a degree in the Meridian, published in the Royal Society’s journal, the Philosophical Transactions. 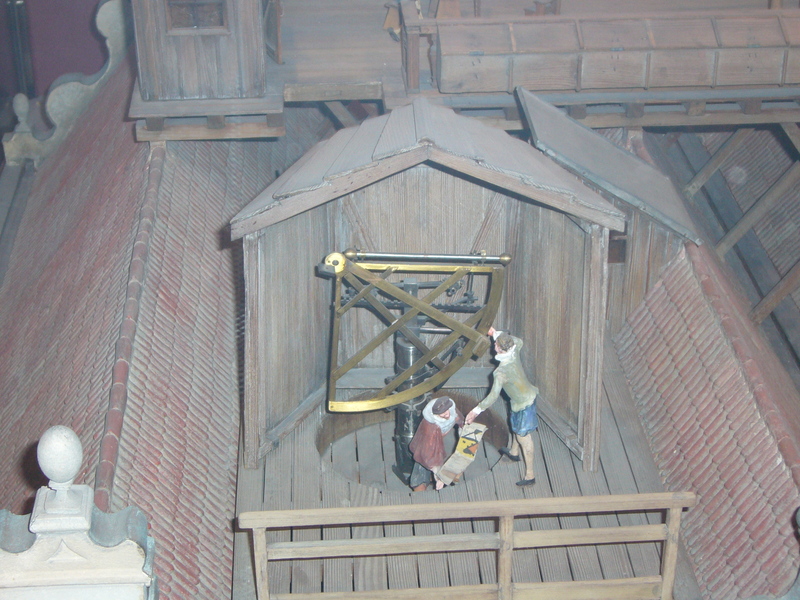 This orientation was inspired by an arrangement of objects in Mining the Museum: An Installation by Fred Wilson, a now-canonical 1992 exhibition at the Maryland Historical Society in Baltimore. Invited to interpret the collections of this venerable, conservative institution, Wilson rearranged, rediscovered and reimagined the Society’s collection, bringing forgotten objects out of storage, and recognising that presenting objects in novel juxtapositions, or with new labels, or even just reorienting them spatially, can furnish radically new or hidden meanings or interpretations. 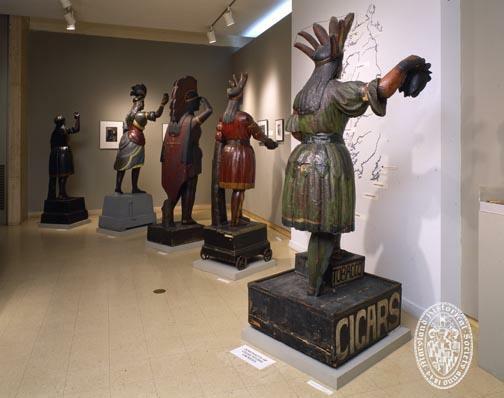 In one display, Wilson placed Cigar Store Indians with their backs to the museum visitors, perhaps suggesting a refusal by the mannequins to be on display, or a rejection of the racist objectification which such wooden models entail. Whilst he was putting problematic objects on display, he quite clearly wasn’t merely recreating or re-enacting past display practices: he was critiquing the display of “Indians” outside of cigar stores, in museums, and elsewhere, rather than merely recreating those modes of display. The Playmobil figures, just like the Cigar Store Indians, are crude stereotypes: warlike (as purchased, they all come with weapons), nameless, and generically “Indian”, being part of the “Western” range. One way in which a representation of humans can be offensive is when it reduces multiple diverse cultures, separated by time, space and beliefs, into one single representation, for instance reducing the variety of historical Native American peoples into one “set”, as these toys literally do. 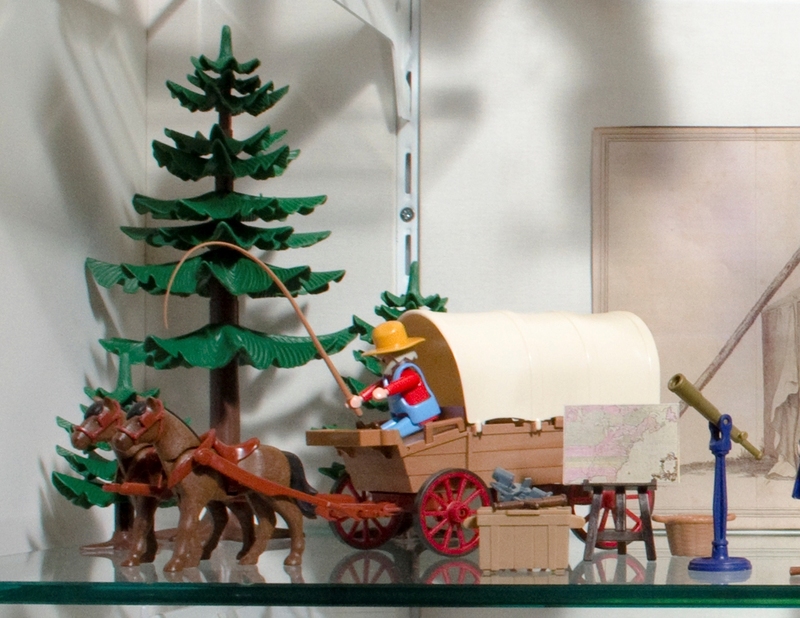 Despite the fact that it is kind of astonishing that Playmobil produce detailed and in a sense realistic sextants, telescopes and quill pens, I don’t think anyone would consider their representations of “Indians” (or my denoting two figures as Mason and Dixon) to be of the school of realism. 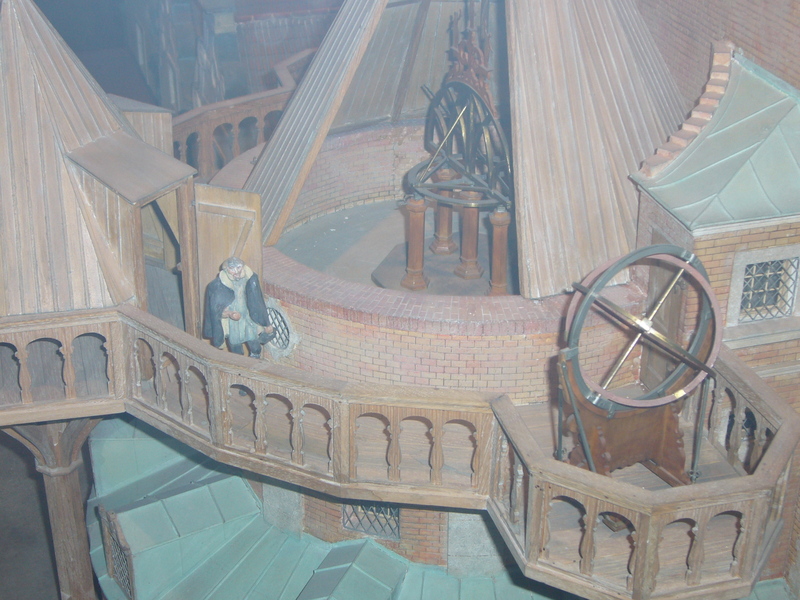 In this sense they differ from the models of James Cook at the National Maritime Museum and Tycho Brahe at the Deutsches Museum, which on some level at least are intended to be realistic. Wilson is playing with obviously non-realist iconography: the non-realism of Playmobil characters likewise, I hope, gave a kind of ironic distance to my diorama. Another reading would be that rather than, or perhaps in addition to, having their backs to the museum visitors, the Cigar Store Indians are facing in the same direction as the museum visitors, animate, with agency, viewing and experiencing the exhibition. Two of the Cigar Store Indians in Wilson’s installation faced, and perhaps contemplated, a map that remained on the wall from a previous exhibition of an American folk-art staple, the decoys used in duck hunting. The map gave the names and locations of historical Maryland/Chesapeake gun clubs. What were the historical origins of these Chesapeake gun clubs, Wilson asked? Whose culture and history have been erased and silenced in this map? Wilson altered the map, reorienting its meaning, by adding to it the names and locations of Native American groups who once lived around the Chesapeake, including, for instance, the Lenape, and the Nanticoke. This map covered almost exactly the same geographical area as the map by Mason and Dixon printed in 1768, and in my placing of the Playmobil figures contemplating that map I tried to raise the similar question of what it represents and what it is silent about. The erasure of people from historical accounts can be crude, and it can be subtle. Mason’s Journal is full of encounters with Native Americans, yet by the time maps and accounts were presented to the Royal Society back in London, they were absent. That the probing westward suited the territorial expansionist ambitions of politicians on both sides of the Atlantic seems evident; that disinterested, abstract philosophical enquiry was a cover for such expansion seems likewise clear. The oddity of the boundary between the two provinces as defined in the London courts can only partly explain why the former assistant to the Astronomer Royal found himself in the woods, thousands of miles from home, spending nearly 5 years checking and rechecking both one of the finest and most expensive pendulum clocks ever made and what was undoubtedly the most precise zenith sector in existence. Imperialism often happens under the guise of science, and in the memorialising and remembering, the science is bracketed off, and sometimes the subjugated peoples are omitted from the narrative. That the Mason and Dixon survey involved a prolonged encounter with Native American peoples is not a secret, either in historians’ accounts or indeed in Thomas Pynchon’s extraordinary 1997 novel. Yet when such episodes are remembered within a history of science context, for instance in history of science museums, the instruments and techniques tend to be bracketed off to one side, and the engagement with, for instance, Native Americans is bracketed off to another side. I sought to present the human encounters between Mason and Dixon and Native Americans not merely as some kind of context to the “real” science. One of the conceits of the diorama genre is that it gives a totalising view: everything is left in. Of course this is utterly illusionary, but I like the way that it doesn’t try to bracket off context. 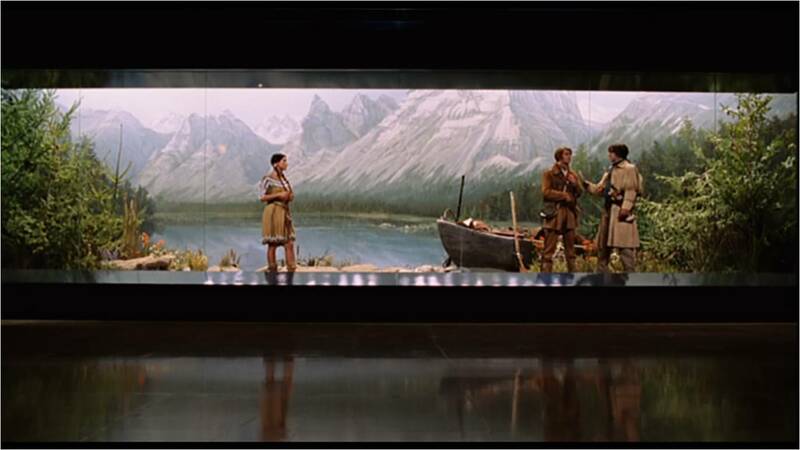 It’s still the case that the models of the Europeans in the diorama have names and are depicted as individuals, whilst the Native Americans are nameless. It’s still the case that I put on display a stereotyped representation of historical Native American peoples that reduces them to a homogenous, largely warlike bloc. My display doesn’t recapitulate such representations, however, but rather questions them. Our representations are always reliant upon and constrained by the representational tools and techniques at our disposal. Going forward, however, next time I recreate famous episode in the history of science in a museum using children’s toys, it will be with Sylvanian Families, because they are really really complicated proxies for gender, race and class. Look out for it. Playmobil, Sylvanian Families and “Night at the Museum” – that’s what I call accessible! Love it.